Traversing my way around the Kala Ghoda Arts Festival, I had the zeal to discover the artist in me. The festival broadens one's perspective about art and erases the boundaries, delving deeper in literature, performance arts, music, cinema and the stand up culture besides visual arts. As someone not natively from the city, I have realised that as you go down South, Mumbai in itself is like a canvas. Adorned with beautiful buildings and with the air preserving history, Mumbai is much about contemporary art. With festival and cultural events celebrating this spirit, these events have gained much attention from art lovers around the city. The Kala Ghoda Art Festival is one of the most popular among such events and brings out the best Mumbai has to showcase. Clad with colours and different types of art installations, the fest appeals the most to those have an aesthetic eye. Visiting the festival this year was my first experience at the event and a mesmerising one. The Kala Ghoda Festival is a must-have in the diary of an art lover in the Maximum City. Having heard much of the festival, curiosity was dwelling on my mind before I finally decided to go and witness the hype in person. What makes the event unique is that it doesn’t restrict art to just some fancy paintings and colours. The festival focuses on expanding the boundaries of the world of art and intends to touch everything creative. It revolves around everything beautiful there is in various art forms, which include, performance arts, literature, music, cinema, the stand up culture and, ofcourse, visual arts. From an outsider’s perspective, the Kala Ghoda Festival broadens one’s mindset and lures people to explore more. And this exploration isn’t just about knowing Mumbai better but about giving ourselves the artistic vent, realising there is so much we haven’t explored about ourselves. There is an artist in all of us and the festival just gives a little push to that urge to try out what we love. Having attended a couple of literature events and just roaming around stalls from both budding and established artists, I was like a little kid left in a chocolate factory. 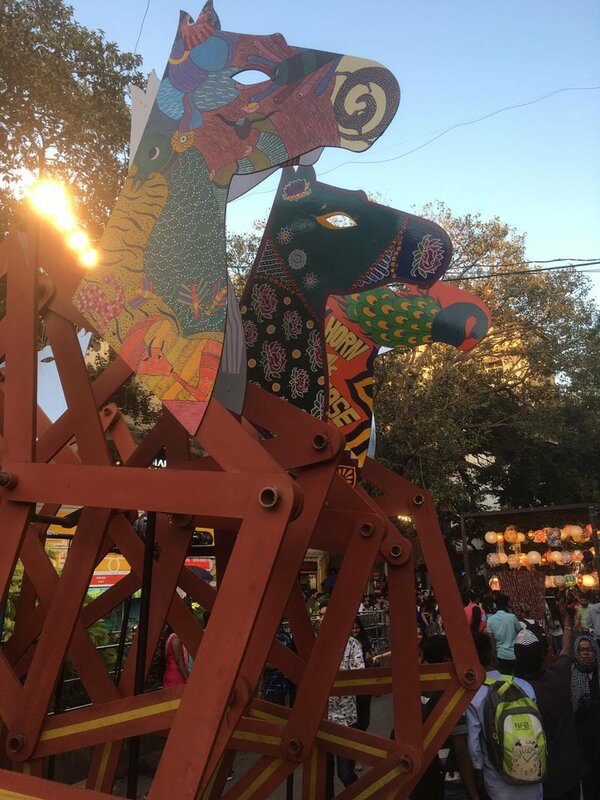 Exploring my way around the festival, I was left with an unuttered sense of appreciation for the effort that would have been put behind making the Kala Ghoda Festival a success, curating and designing a piece of heaven on earth for art lovers. Due to the paucity of time, there was much that remained unexplored but it made me determined to visit the festival again next time, just making sure I have the entire day in my hand to go bezerk with exploring everything there is for the festival to offer. It is true that it would need a team to cover the entire festival because Kala Ghoda offers the maximum possibilities to shake hands with art, just like the Maximum City offering you the maximum opportunities to dream. The Kala Ghoda Art Festival is as dream-like as it sounds and will satisfy the artist in you in ways you can barely imagine.